I am a regular passenger of the rails in Slovakia. In other words I am a nerve champion drilling frequently while commuting to Bratislava. My route is from Bratislava to Komárno (almost) and back, and my transporter is Regiojet Student Agency. During my ‘travels’ I’ve come to observe a lot of unsatisfied customers and a lack of interest in their satisfaction. The train is frequently late and almost always fails to give the passengers information in the estimated delay or the cause of delay. The delays are of various lengths, up to cca 50 minutes (usually 15-20) which 100% of my travel (the normal length of my journey is 50 min.). This also creates a lot of problems, since most of the passengers travel to work, and need to be on time. It is possible to check the delay of your train at http://mapa.zsr.sk/, but most of the passengers don't know this site. If you are on the train, it often just stops and leaves you you wondering. When asked why we are waiting, some of the stewards just reply ‘I don't know.’ Thus I conclude that in general no one cares if the passengers of the trains are well-informed and satisfied. According to the European Union, however, the passengers have the right to always know the adequate information on delay. 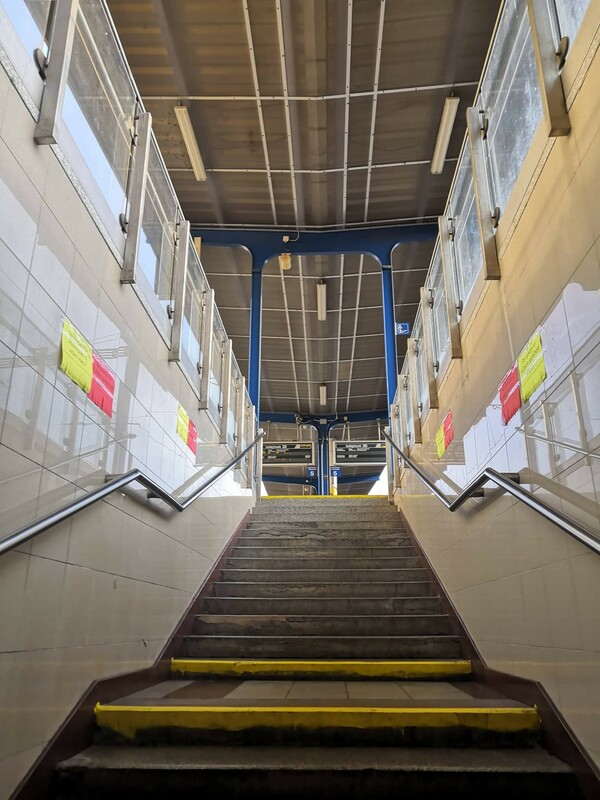 (https://bettertransport.org.uk/media/01-october-2016-consumer-rights-act-and-what-it-means-rail-passengers) After frequently being late, I decided to comment on this problem. I chose to create a little questionnaire, which asks the passengers two simple questions: Are you satisfied with the service of Regiojet Student Agency? Do you feel well-informed about your train? The customers could vote by simply tearing a piece of paper with an emoji according to their feeling. Such questionnaires are usually presented by companies improve their service and show the care for their customers. In this case the questionnaire comments on the fact that Regiojet lacks these tendencies in my opinion. I was hoping to draw attention to the fact that the passengers are neglected. The questionnaire also featured a little note saying that this is an independent project, not an original Regiojet questionnaire. 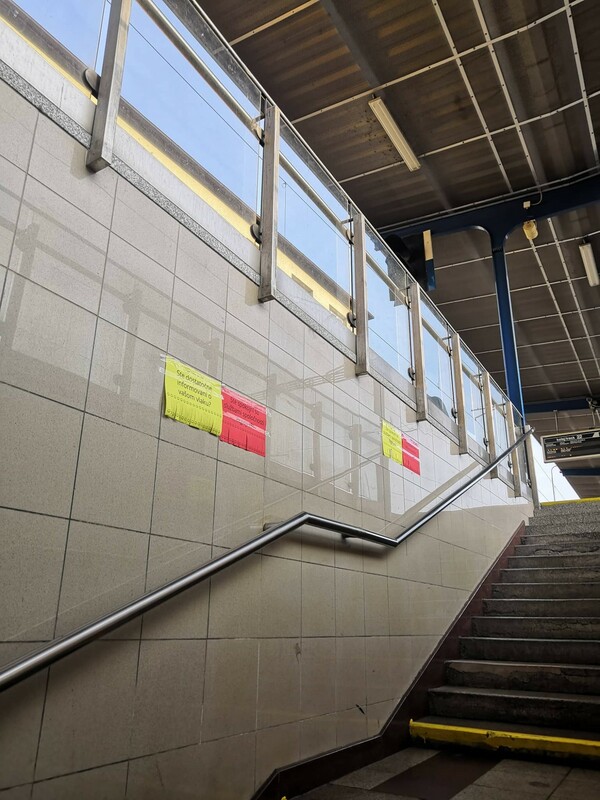 After printing I hang my questionnaires on the walls of a staircase leading to platform no. 5. 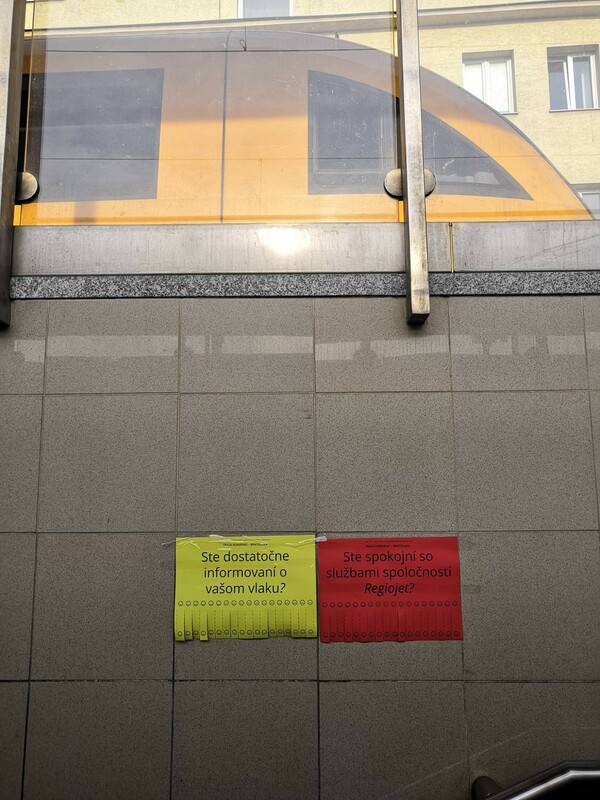 While hanging these, a group of passengers were going to the platform to get on a Regiojet train. The notices draw their attention, some of them voted immediately. I left the staircase just for few minutes, but when I came back, the questionnaires were gone. Due to time management I decided not to hang the notices again. I decided to leave it as it is, with this gesture showing precisely how Regiojet cares for their customers. I hang the questionnaires along the staircase to platform 5, from which Regiojet usually departs. The questionnaires look similar to how Regiojet communicates with their customers, but have a little notice, that they are an independent project. 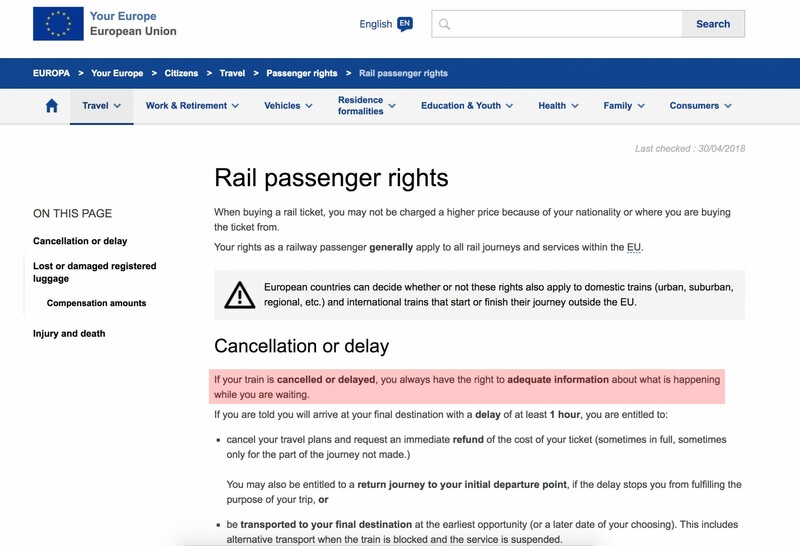 According to European Union, passengers have the right for adequate information on their trains.